Newsroom | Conneston Construction, Inc.
Meredith Village Savings Bank celebrates the completion of their newest branch. 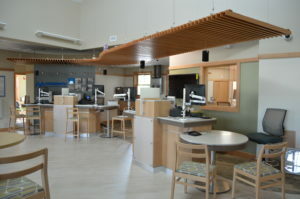 The 4,200 square foot branch located on Lafayette Road features lots of day lighting and contemporary finishes. The New Hampton School Jacobson Ice arena consists of 34,000 square feet of new space. Aside from the ice arena, the program includes 4,000 square feet of locker room facilities and a 2,000 square foot multi-function space, which has been designed to serve as a viewing area, function room and lobby for the facility. The arena also features bleacher seating for 120 spectators, laundry facilities and a training room. A spacious, exterior covered porch provides seating and shelter for day student drop-off and pick-up. The townspeople of Holderness have a newly renovated and much larger library in town. The original library was only 2,600 square feet, so an addition of 2,500 square feet and renovation of 1,000 square feet of existing space has created a welcoming space for old and new generations alike. The Center Harbor Inn, now owned and operated by the Cutillo family, who also own and operate the Steele Hill Resort and the Summit Resort, received a much needed facelift and extensive renovations. Prominently located on the shores of Lake Winnipesaukee, this thirty-three room inn received the best treatment during its renovation. Merrimack County Savings Bank has opened its most recent branch office at 360 Londonderry Turnpike in Hooksett, NH. This is the Merrimack’s second location in Hooksett, complementing the first office at the Hooksett Welcome Center off I-93 North. The Girl Scouts of the Green & White Mountains’ Camp Farnsworth in Thetford, VT, celebrated the addition of a new bunk house and renovated dining hall just in time for the campers arriving for the summer. 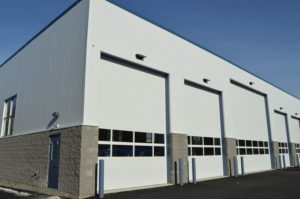 Irwin Marine is occupying its new 8,100 square foot boat maintenance facility in Laconia, NH. The addition of this facility alleviates space constraints in their primary facility, and with the inclusion of a hoist crane with a 4-ton capacity, allows Irwin’s mechanics a more efficient way to work on their clients boats. Titeflex Aerospace in Laconia recently moved into their new 47,000 square foot manufacturing addition. For the project, a key concern for Smiths Group, the parent company, and Titeflex Aerospace was continuing to reduce the environmental impact while increasing renewable energy resources. There was a focus on the integration of best practice environmental considerations into current and future operations. One of the key features of the new space is a sizable reduction in energy and waste, with the intention to cut water discharge to zero over time through a state of the art recycling process. Other green initiatives include high efficiency lighting and utilization of natural light with more exterior windows. The new parking lot features a surface with porous pavement, over aggregate layering to filter water run-off and to reduce the risk of flooding in the surrounding area. In a ribbon cutting ceremony, New Hampshire Governor Maggie Hassan joined with state officials and private partners to dedicate the northbound Welcome Center in Hooksett in honor of late Executive Councilor Ray Burton. Copyright© 2019 - Conneston Construction, Inc. and Mainstay Technologies, LLC. All rights reserved.